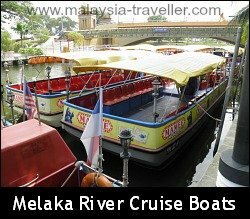 The Melaka River Cruise is a great way to see the sights of Melaka at a leisurely pace, in comfort and without breaking the bank. A few decades ago the river was a stinking waterway lined with decaying houses on stilts and the untidy rear side of crumbling shophouses. In recent years it has had a major facelift. Yes, there has been a lot of new development but at the same time an effort has been made to preserve many of the historic buildings and bridges along the river. 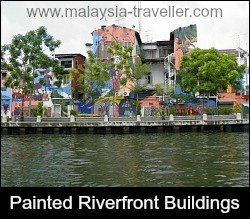 Even the newer buildings have been painted with colourful murals depicting different aspects of Malacca's rich history and culture. Muara Jetty, next to Quayside Heritage Centre, close to the Maritime Museum easily recognisable by the replica of the Portuguese ship Flor De la Mar. From here the cruise takes you upstream as far as Taman Rempah jetty where the boat turns around and brings you back to the starting point. The round trip takes 45 minutes and covers 9 km.The boat's recorded commentary will begin on the return leg of your journey (from Taman Rempah to Muara Jetty). Taman Rempah Jetty, where a small spice garden is located, next to the Hang Jebat Bridge linking Jalan Tun Mutahir to Jalan Tun Sri Lanang. From here the cruise travels downstream as far as Muara jetty where the boat turns around and takes you back to the starting point. The round trip takes 45 minutes and covers 9 km. You will hear the recorded commentary as far as Muara jetty. On the way back you might be treated to Abba's greatest hits or a similar soundtrack. The Shore Jetty, next to The Shore Melaka, a retail, hotel and residential development containing attractions such as Shore Oceanarium, Sky Tower, Toy Museum and 3D Interactive Park. 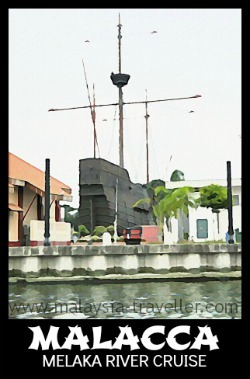 Melaka Pirate Park, a small amusement park is also located nearby. Again the river cruise lasts 45 minutes round trip. Although I saw some posters advertising a hop-on, hop-off route, that option does not appear to be available at present and you can only do a round trip with no disembarking en-route. That's a pity. If you are driving to Melaka you will discover that finding a parking space in the town centre is not easy. If you just want to do the river cruise I would suggest you catch the boat at Taman Rempah jetty because they have a large car park and it's free of charge. Alternatively you can park at The Shore and board the river cruise here. MyKad holders pay RM 25 for adults and RM 15 for children aged 2 to 12. Foreigners have to pay a little more, RM 30 for adults and RM 25 for kids. If you want to arrange a group outing or corporate event you can charter the whole 40 seat boat for RM 1,000. 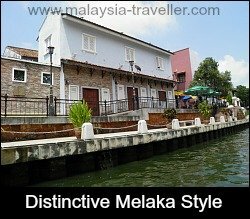 The Melaka River Cruise is open daily from 9 am to 11:30 pm. The Shore Jetty counter hours are 10 am - 10 pm. The first boat departs at 11 am and the last boat is at 10 pm (must buy last boat tickets before 9.30pm. Boats from The Shore Jetty depart every hour on the hour. Which is the better time to go, by day or by night? At night many of the sights alongside the river are illuminated with colourful lights. But on the other hand, during the day you will get a better view of the murals and other details. You are also more likely to spot one of the monitor lizards which frequent the river bank. Perhaps you should go at sunset so that you can see both day and night. 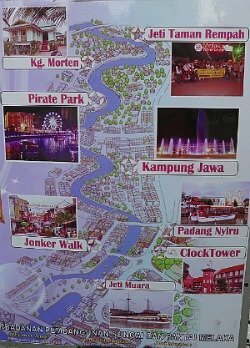 For more details you can call the Melaka River Cruise company on 06 281 4322/23 during office hours. The number for their Taman Rempah jetty is 06 286 1530. The number for their Muara Jetty is 06 286 1531. Kampung Morten. A traditional Malay village and living museum. Some of the houses, notably Villa Sentosa, are open to the public. Pirate Park. A modest funfair with a ferris wheel, swinging pirate ship, flying fox, rock climbing wall and trampoline. Ghost Bridge of Melaka. Where Japanese soldiers during WWII dangled the decapitated heads of local Chinese businessman. Kampung Jawa. A small residential and commercial area where descendants of the original Javanese settlers still maintain some of their traditions. Clock Tower. In the famous square of red painted Dutch buildings. Jonker Walk. 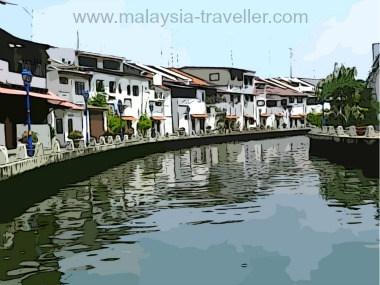 One of the best streets in Melaka to shop for souvenirs and enjoy local speciality dishes.